The entry-level Lamborghini Huracan Evo has arrived in India with a naturally aspirated V10 engine. Lamborghini India has introduced the brand new Huracan Evo which uses the underpinnings of the extremely mental Huracan Performante are attempts to make it more attainable and tameable for everyday road use. The Huracan Evo uses the same naturally aspirated 5.2-litre V10 engine which develops 631bhp and 600Nm of torque found in the Performante, which is a generous boost from the regular Huracan which offered a mere 601bhp. However, the dry weight of the Huracan is identical to the new Evo as both vehicles weigh in at 1,422 kilogrammes. 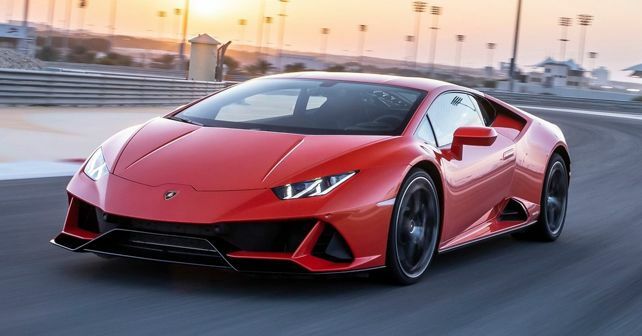 Lamborghini has also given the Huracan Evo titanium intake valves and refined lightweight exhaust system which not only helps the car’s performance to achieve the above-mentioned feats but also makes it sound even better. The Huracan Evo is equipped with Lamborghini’s ANIMA dynamic driving modes, the driver can choose between ‘STRADA’ (street), ‘SPORT’ or ‘CORSA’ (track). Lamborghini has also equipped the Evo with rear-wheel steering. The styling of the Huracan Evo has also been tweaked significantly at the front and rear. And it looks just as mad as a Lamborghini should. People who criticised the old Huracan’s looks, saying that it was conservative for a Lamborghini, might just be happier with the updates that Lamborghini has provided on the Evo. The front bumper and the air intakes are brand new and larger, the side skirting and a significantly reworked and redesigned rear. The interior also gets new features like a new centre console with a brand new 8.4-inch touchscreen with Apple CarPlay while the rest of the cabin remains largely unchanged. The Huracan Evo is the replacement for the old Huracan LP610-4 and it is priced at Rs 3.73 crore (ex-showroom, Delhi).